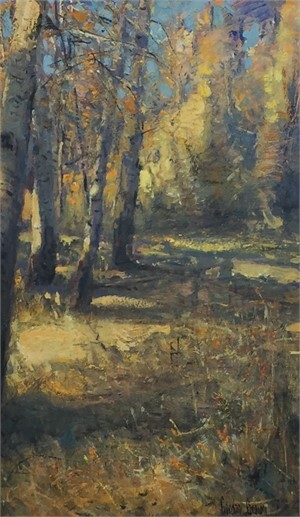 "There is something about just going to an edge and looking at space and air..."
A Colorado native, Gordon Brown speaks reverently of the majestic western wilderness that is his home, his passion and the main subject of his compelling paintings. The viewer is at once transported to an imperfect moment in time where light and cathedral-like rock converge. Hues of amethyst and clay colors vibrate with resonance and the sensation of space is infinite. Brown has achieved his aim: To create an intimate relationship between the viewer, himself and his beloved landscape. From his earliest years he was rarely found without pencil or paintbrush. Weekend backpacking trips into the Colorado canyons were the ritual, and following days would find him assembling his newly found Ute arrowhead collection or painting Indians and their campgrounds. Teachers and artists strongly encouraged him to pursue his artistic talent, but this was not fully realized until years later when Brown was mesmerized by the work of Chinese artist, Shang Ding, who was to become his tutor and mentor. 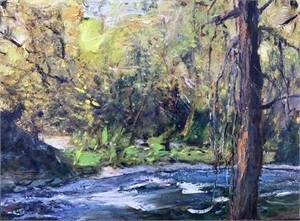 In true historical tradition, Brown apprenticed under Professor Ding of the Beijing Central Art Academy, accompanying him as they made their way through the landscape, emulating his every brush stroke in a plein air style. Today the young Brown is recognized as a next Old Master. Taking Best of Show and First Prize in many competitions, 1992 culminated in the Grand Prize for Arts in the Parks "Grand Canyon Award" in which Brown superseded over several hundred applicants. 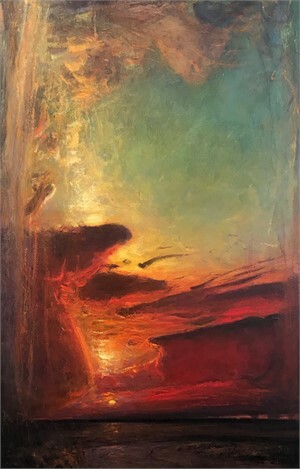 His entry, "Breaking of Light" is expected to tour several southwestern museums and will become a part of the Grand Canyon Natural History Association's permanent collection. The Denver Art Museum has purchased a large oil for their permanent collection. It hangs on the 7th floor. The Forbes Collection has also recently purchased a painting and Gordon was one of only a few American artists to participate at a show at the U.S.Ambassadors Quarters at The Hague. "There is something about just going to an edge and looking at space and air..." A Colorado native, Gordon Brown speaks reverently of the majestic western wilderness that is his home, his passion and the main subject of his compelling paintings. The viewer is at once transported to an imperfect moment in time where light and cathedral-like rock converge. Hues of amethyst and clay colors vibrate with resonance and the sensation of space is infinite. Brown has achieved his aim: To create an intimate relationship between the viewer, himself and his beloved landscape. From his earliest years he was rarely found without pencil or paintbrush. Weekend backpacking trips into the Colorado canyons were the ritual, and following days would find him assembling his newly found Ute arrowhead collection or painting Indians and their campgrounds. Teachers and artists strongly encouraged him to pursue his artistic talent, but this was not fully realized until years later when Brown was mesmerized by the work of Chinese artist, Shang Ding, who was to become his tutor and mentor. 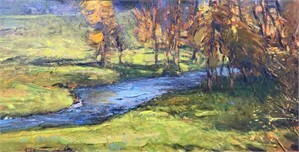 In true historical tradition, Brown apprenticed under Professor Ding of the Beijing Central Art Academy, accompanying him as they made their way through the landscape, emulating his every brush stroke in a plein air style. Today the young Brown is recognized as a next Old Master. Taking Best of Show and First Prize in many competitions, 1992 culminated in the Grand Prize for Arts in the Parks "Grand Canyon Award" in which Brown superseded over several hundred applicants. 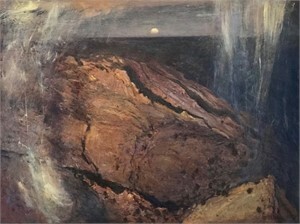 His entry, "Breaking of Light" is expected to tour several southwestern museums and will become a part of the Grand Canyon Natural History Association's permanent collection. The Denver Art Museum has purchased a large oil for their permanent collection. It hangs on the 7th floor. The Forbes Collection has also recently purchased a painting and Gordon was one of only a few American artists to participate at a show at the U.S.Ambassadors Quarters at The Hague.